Moms’ lives are busier than ever these days. Apps can help you keep track of your calendars, plan your meals and even save money. Here are the top apps that all moms should have on their phones. Cozi – This app keeps track of all your schedules and calendars. It is able to sync across all phones and mobile devices, so all members of the family will know what is going on. Evernote – Need to make a note of an extra soccer practice? Evernote is great because it syncs with a desktop or laptop, so you can take notes while at work or on the computer and have them readily available later on your phone. AllRecipes – The best part about the AllRecipes app is the dinner spinner. Simply enter the main ingredient that you have on hand, and it will search for recipes including that ingredient. You can even exclude ingredients that you don’t like! AnyList – This grocery list app divides up your list by category such as meats, canned goods, produce, etc. making it easy to run through the grocery store quickly. It can sync with other phones, so you can create a list for your spouse heading home from work. Big Oven – Not only does BigOven have a recipe database you can browse, it will also make a shopping list of ingredients necessary and can tell you how to use up those leftovers in the fridge. Walmart Savings Catcher – If you shop at Walmart at all, use their SavingsCatcher app once you’ve finished your shopping. Simply take a picture of your receipts and it will check the sales in your area at different stores. If there is a difference in price in your favor, they will issue you store credit for the difference. This typically only works on name-brand products. Target Cartwheel – This app specifically works at Target; simply scan the barcode of your receipt and get savings. The more you scan and save, the more offers will open up on your account. RetailMeNot – Use this app when checking out at an online store. It will show you coupon codes you can use upon checkout to save money. These can be from as small as 5% to as much as 50-60%. iBotta – This app can save you money after checkout as well. This app is almost exclusively for food and grocery items, and typically only on name brand items. They have special deals on certain weeks, so you want to look at it before you shop to see if there is a deal you want to pick up. Checkout 51 – While relatively new, Checkout 51 is simple to use. It is similar to Ibotta, except it doesn’t always require a name brand item. Sometimes simply buying a dozen eggs is enough to get you a discount. You may only be able to save a few dollars a week, but it adds up. KeyRing – If your key ring or wallet is stuffed with store discount cards, this app is perfect for you. Simply scan the barcode into the app, and it stores it for you. When you need it at the store, simply pull up the app and scan the barcode from there. MapMyFitness – This app is great for working out. Whether you are a walker or runner or any other type of fitness enthusiast, Map My Fitness will track your mileage, calories burned and other information. My Fitness Pal – If you want to track your calorie intake, this is the app for you. Once you set up your account, simply tell it how much weight you want to lose per week and it will tell you how many calories you need to eat to accomplish the goal. DietBet – If you like a challenge to accompany you in your weight-loss goal, sign up for a diet bet. While the app itself is free, the program isn’t. To sign up for a diet bet, you pay a low fee, typically $25-$35, and bet that you can lose up to 4% of your body weight in a month. If you make your bet, you not only win back your entry fee, but you get to split the entry fees of the people who didn’t win the bet! 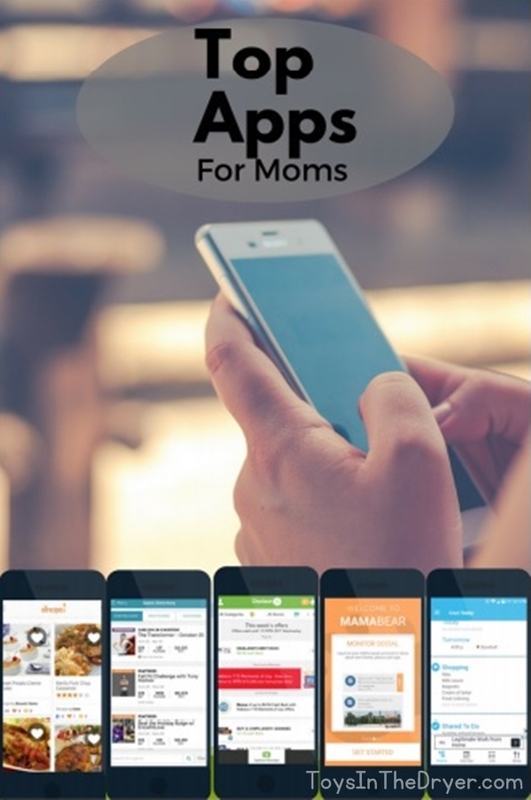 Mama Bear – This app is great for moms who have older children with their own phones. It helps you keep track of where they are and where they are going. You can also keep tabs on their incoming and outgoing text messages and their social media accounts. Mom Maps – Ever wondered what there is to do in town with your kids? This app can help you find playgrounds, parks, and other fun things through your GPS location. It will even give you a map to get there, as well as reviews from other parents. Artkive – If you feel bad about throwing out your child’s artwork, this app is perfect for you. Simply take a picture of the artwork, and Artkive will organize it by each child. When you’re ready, they’ll send you a hardback book filled with pictures of all the artwork. It takes a bundle of art that no one ever looks at to a picture book you’d feel proud to put on the coffee table. Chore Checklist – This checklist is perfect for the mom who needs a reminder to do chores; simply set up a preference for how often you want to do things. For example, do you want to be reminded to clean your ceiling fans every other month? It’ll send you a reminder. You can also set it up to tell you all the steps to cleaning something, so you don’t miss a corner while cleaning. If you found this list of top apps for moms helpful, please show Rebekah some love over on her site!